Nick's Collingwood Bulletin Board :: View topic - Game On! JLT. Pies v. Bulldogs. All comments please. Game On! JLT. 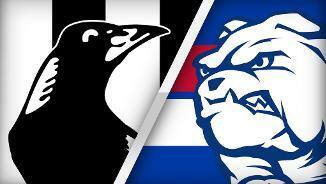 Pies v. Bulldogs. All comments please. Post subject: Game On! JLT. Pies v. Bulldogs. All comments please. Ted Summerton Reserve (Moe, Vic). 1.05 EDT. Two easy goals for the Dogs. Bulldogs are dominating, but haven't translated it on the scoreboard.